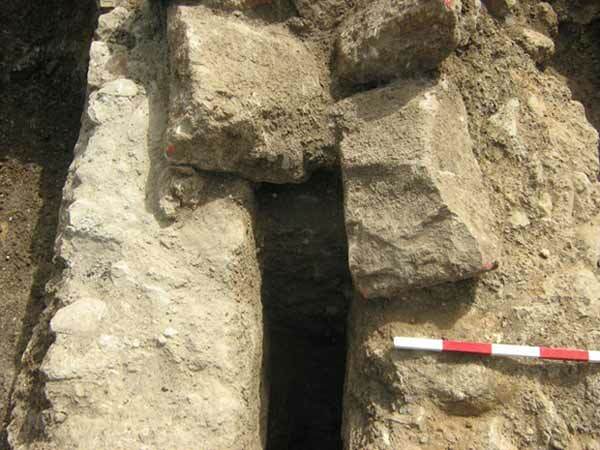 In May 2013, an excavation was conducted in the fields east of Kibbutz ‘Evron (Permit No. A-6803; map ref. 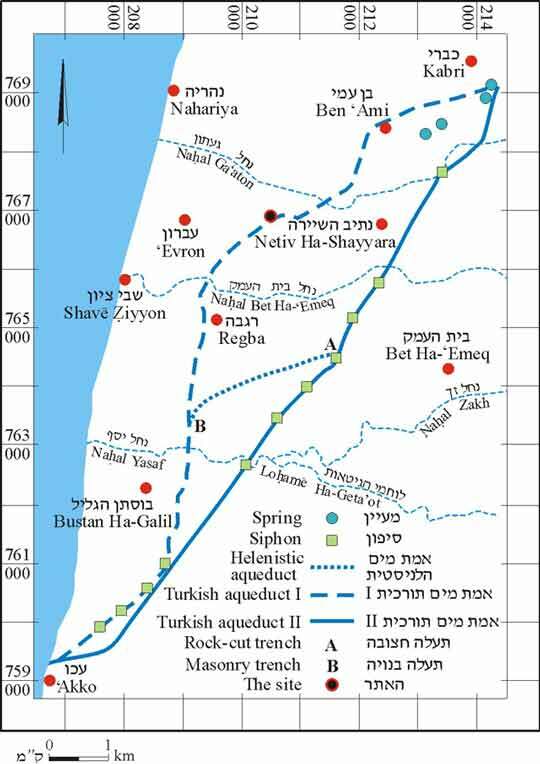 210873–9/766706–15), following the discovery of a section of an aqueduct along the route of the main water line leading to the southern neighborhoods of Nahariya (Fig. 1). The excavation, undertaken on behalf of the Israel Antiquities Authority and financed by the Mekorot Company, was directed by R. Abu Raya (photography), with the assistance of Y. Ya‘aqobi (administration), R. Mishayev and M. Kahan (surveying) and A. Shapiro (GPS). A section of the Ottoman aqueduct built by Suleiman Pasha in 1814, which conveyed water from ‘En Shira (‘Ein el-Basha), the highest of the Kabri springs, to ‘Akko was exposed. The aqueduct was in use until 1948, and is the latest of three known aqueducts in the region: the early one is ascribed to the Hellenistic period, and the other was built by el-Jazzar (Fig. 1). Suleiman Pasha’s aqueduct was constructed slightly west of el-Jazzar’s aqueduct, along the kurkar ridge east of the ‘Akko–Nahariya road, through which three streams flow: Nahal Ga‘aton, Nahal Bet Ha-‘Emeq and Nahal Yasaf (Frankel, Getzov and Friedman [Syon] 1989:81–96). The two Ottoman aqueducts, that of el-Jazzar and that of his successor, Suleiman, were built within a brief period of time, as indicated by Suleiman's declaration of the rebuilding of the aqueduct in 1230 AH (1814 CE). The declaration and an account of the aqueduct’s construction are described in a biography of Suleiman Pasha compiled by Ibrahim el-‘Urah. El-‘Urah tells of blockages in el-Jazzar’s aqueduct, as well as damaged and destroyed sections of the conduit, especially in its southern part, near ‘Akko; this part of the aqueduct was deliberately plundered by ‘Ali Pasha, one of the city’s notables, who used the northern part of the aqueduct to irrigate his farm near “el-Manfukh” stream (he probably meant el-Mafshukh, named in Hebrew Nahal Ga‘aton; el-‘Urah 1936:258–259). Sections of the aqueduct can be seen today east of the ‘Akko–Nahariya road, near Kibbutz Lohemei Ha-Geta’ot. Part of it was previously excavated between two siphon towers north of ‘Akko (Stern 1990:17). Here, the aqueduct was one meter high, and the channel was replaced with three pipes. An excavation of another section of the aqueduct, founded on a kurkar hill, uncovered a channel covered with stone slabs (Porat 2006). 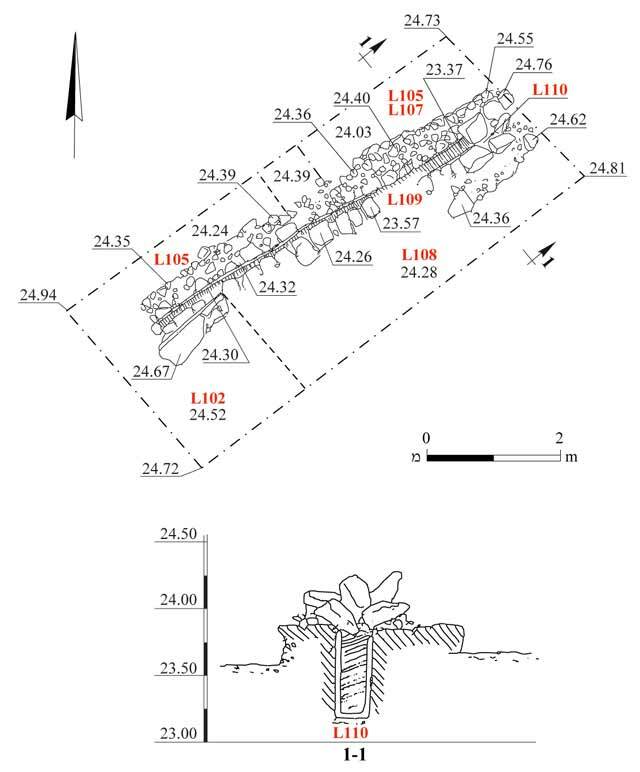 A rectangular excavation area (3.1 × 7.3 m; Fig. 2, 3) was opened. 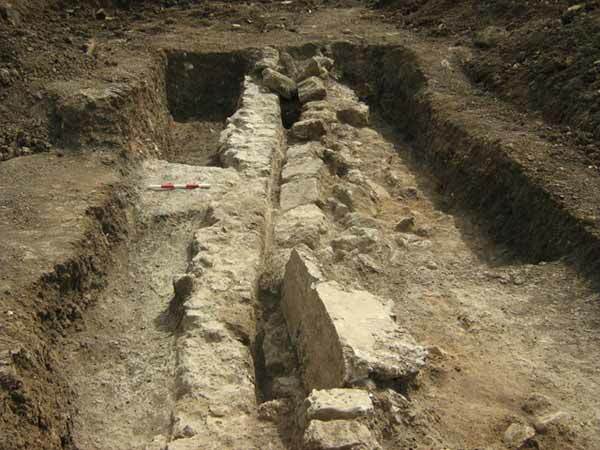 A section of the aqueduct—a channel set on alluvium and aligned in a north–south direction—was unearthed in the middle of the excavated area. Its two walls, which are not equal in width (inner height c. 0.9 m, inner width 0.18–0.20 m, outer exposed height c. 0.5 m, outer width 0.45–0.60 m), were built of irregularly shaped kurkar and limestone and small fieldstones bonded with especially hard gray mortar. The aqueduct was covered with soil on the outside, and treated with hydraulic plaster on the inside. For most of its length it was covered with kurkar and limestone slabs (length 0.4–0.6 m; Fig. 4). The western wall had buckled, apparently due to pressure exerted by the soil; this pressure probably also caused the cover stones to settle (Figs. 4, 5). 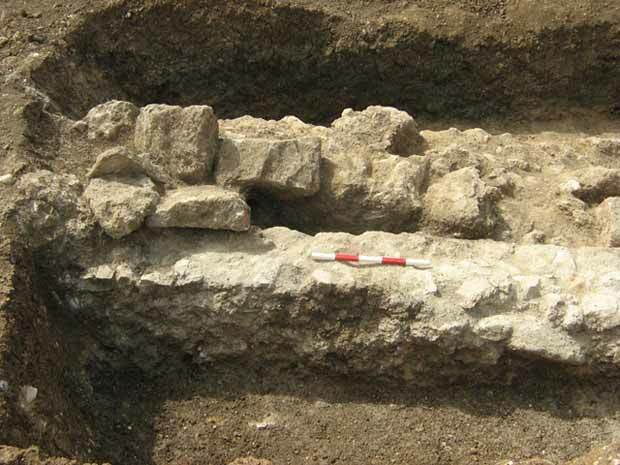 A small concrete wall built in the southern section of the aqueduct and running along the middle of the channel is evidence of the installation’s late phases of use (Fig. 6). 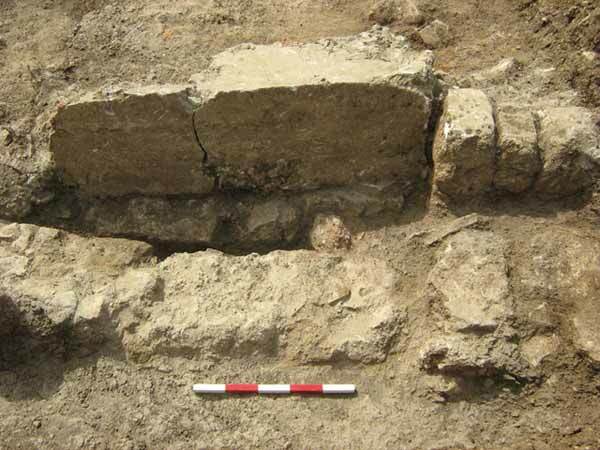 The excavation did not reveal any indication of an earlier aqueduct, and no pottery vessels or other finds were discovered in it. Frankel R., Getzov N. and Friedman (Syon) D. 1989. The Aqueducts of Acre and the Western Galilee. In D. Amit, Y. Hirschfeld and J. Patrich eds. The Aqueducts of Ancient Palestine: Collected Essays. Jerusalem. Pp. 81–96 (Hebrew). Porat L. 2006. ‘Akko, the Aqueduct. HA-ESI 118. Stern E. 1990. ‘Akko: the Ottoman Aqueduct. HA 75:17–18 (Hebrew). El-‘Urah S. 1936. Tarikh Welayet Suleiman Basha el-‘Adel. Sayda (Arabic). 2. The aqueduct, plan and section. 3. The aqueduct after the excavation, looking north. 4. The channel and cover slabs that settled in it, looking north. 5. The aqueduct’s western wall, looking east. 6. A concrete wall built above the middle of the aqueduct, looking east.